Gods and genders run amok in a campy classical romp. Gender is not just crossed in Stolen Chair's Stage Kiss: It is double-crossed and triple-crossed until it has nearly been crossed out entirely. Promiscuously adapted from John Lyly's ribald comedy Gallathea (1588), Kiran Rikhye's neoclassical farce is set on an ancient Greek island that loses a virgin every year to the lust of the sea god Neptune. Two fearful maidens, floral Gallathea (MilkMilkLemonade's Phelan) and hardy Phyllida (Eckert), hide in the forest dressed as guys—in which guise they fall in love. 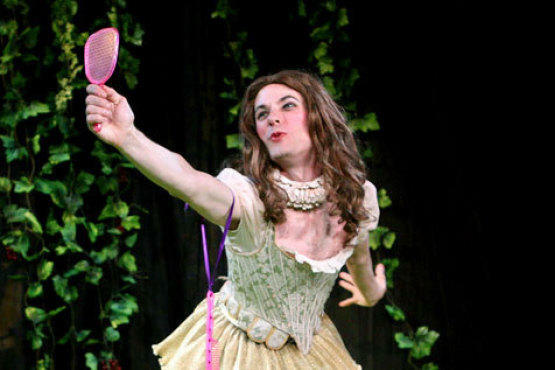 When Gallathea dons women's weeds to impersonate her sister, Stage Kiss hits its neatest tangle: a boy playing a girl playing a boy playing a girl courts a girl playing a girl playing a boy. Boy! For working out this mad Grecian formula, kudos go to the clever Rikhye—who makes Lyly's strange story queerer still, doubling the finale's wild presto chango—and her Stolen Chair cofounder, director Jon Stancato. Stage Kiss gets off to a shaky start in a scene between a galumphing Neptune (Schultz, who doubles as Phyllida's bawdy mother) and a slatternly Venus (Green, who returns as Gallathea's desperate dad). But the comedy finds its footing once it moves into the woods—three blow-up palm trees—of David Bengali's silly set. A bargain in the Wings Theatre basement, this spunky production plants a big sloppy smooch on its audience, whose guard it has lowered with glasses of wine. And Phelan and Eckert, charmingly bent and adept at mixing poise and camp, strike unlikely sparks of romantic truth amid sparkles of frolicsome artifice. Wings Theatre (see the Off-Off List). By Kiran Rikhye. Dir. Jon Stancato. With Andy Phelan, Liz Eckert, Noah Schultz, Liza Wade Green. 1hr 20mins. No intermission.